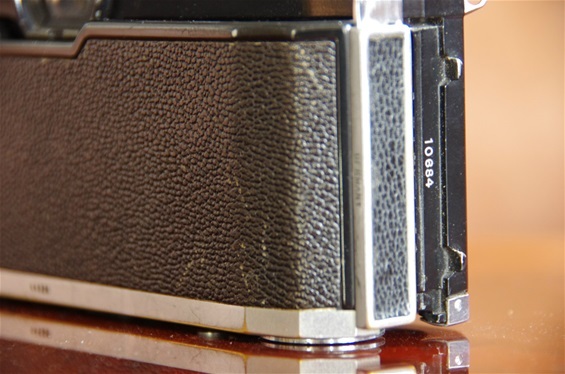 The Contax S was Worlds second 135 film penta prism single lens reflex camera. The constructors at Zeiss Ikons (Contax) main factory in Dresden, Germany, had worked on a penta prism project since before WWII. They probably also went on during the war, but the city, and thereby the factory, was heavily bombed and almost totally destroyed during the months leading to the german defeat in 1945. After the war, Germany was split into an eastern and a western zone, the eastern led by the Soviet Union and the western by the USA. Dresden was from now a part of East Germany. The city was rebuilt remarkably fast. The photo industry counting Contax, Praktica and Ihagee Exakta were all placed in or around Dresden, and were rebuilt or reorganized. 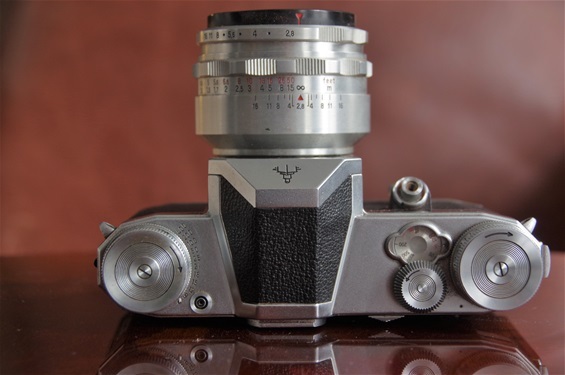 At Contax, the PP SLR project went on. A new developing group, led by Wilhelm Winsenburg and Walter Hennig, was set up in 1946. In the autumn of 1948 they presented a prototype at the important St. Erik Fair in Stockholm, Sweden. The year after a newer version was presented at the official presentation at Leipzig Spring Fair (March) in East Germany. According to different German sources and experts on the Dresden camera history, a series of 2400 pieces were produced from September till December 1949. Production was stopped due to technical problems, both with some elements on the cameras and some problems with production line. Some of these cameras probably reached the public. Next production was started in march 1950. Until recently there has been uncertainty among some German experts as to the September production being a preproduction or a full series production. I have been in contact with some of them to try to sort it out, and as from early July 2013 they seem to be consolidated on September as start of production, though there still seems to be some uncertainty about when preseries went into sales production. 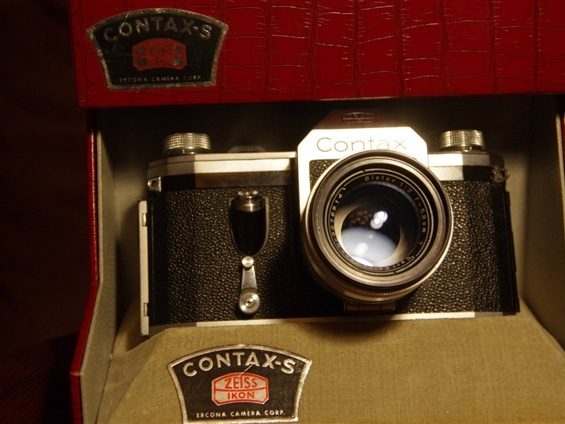 From my definition of being series produced and market ready, the Contax S was, again probably, at sale from sometime between September and December 1949. 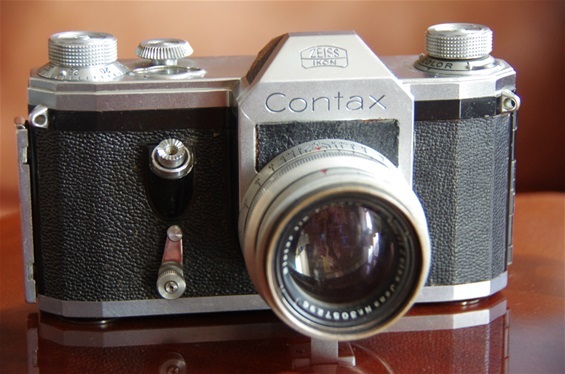 Compared to the italian Rectaflex, the Contax S was one year too late to be the world number one PP SLR! So, what is on every site, Wikipedia and Camerapedia, repeated all the time, just does not seem to be true. 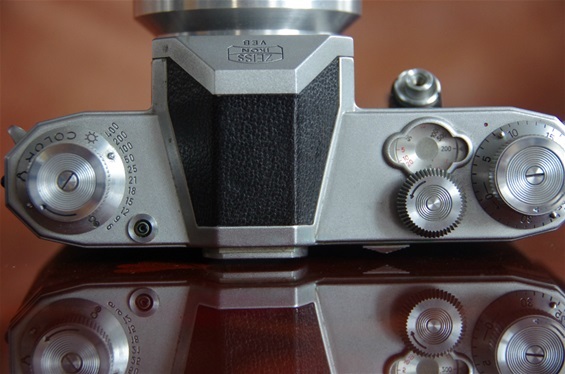 Contax of Dresden was probably the first company to start working on an SLR penta prism model, but they were not the first to show a working prototype publicly and not the first to start series production and sales. 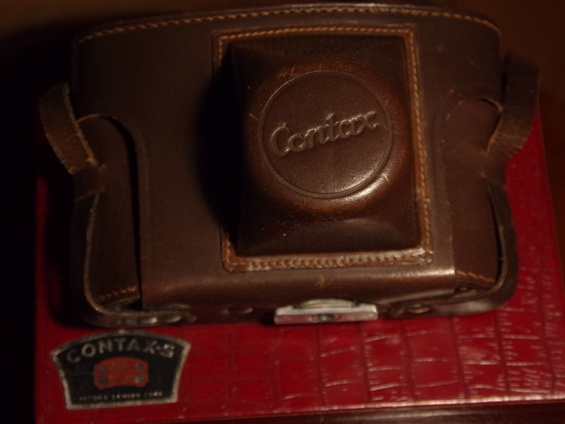 This said, Contax was a very important forerunner in the development of the PP SLR! 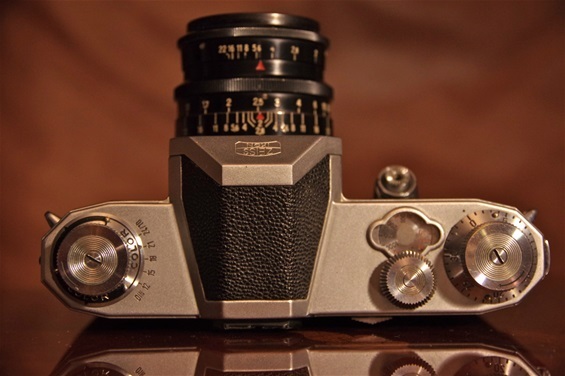 The Zeiss Ikon Contax S. Series production started sometime between September and December 1949. Some Dresden experts claims September, others are in doubt whether the first ones were prototypes and test series. 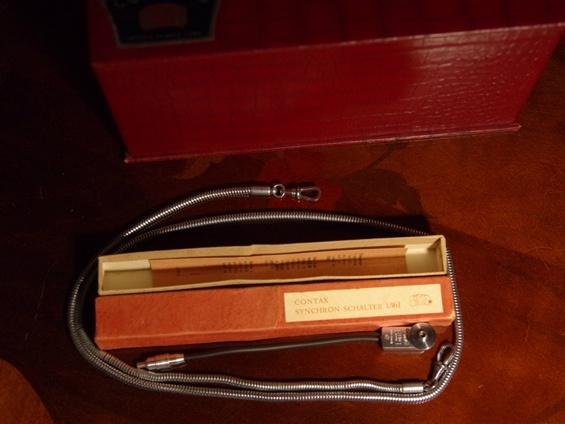 The model pictured is often called type C, the first model with selftimer. (This was offered as an option as some samples come with a blinded hole.) It is produced in 1950, thus belonging to the second production series. Size: 147x84x53 mm. Weight: 550 grams. Sn: 10684. 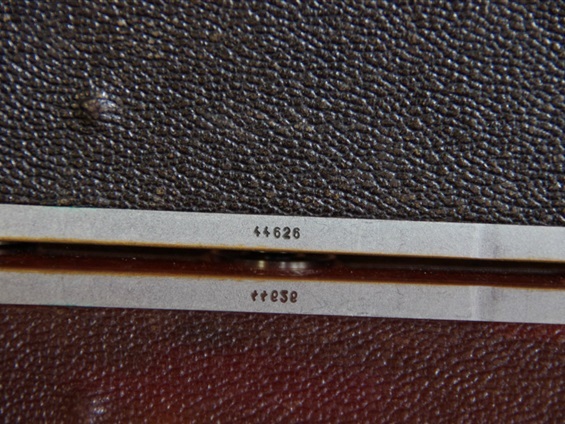 Details on top handles: the time setting dial started as a cylindric shape, but on this model, most samples had this coned dial. As Contax had problems with exact shutter times at 1/25 and 1/250 second, the numbers were changed to 1/20 and 1/200 from this model. 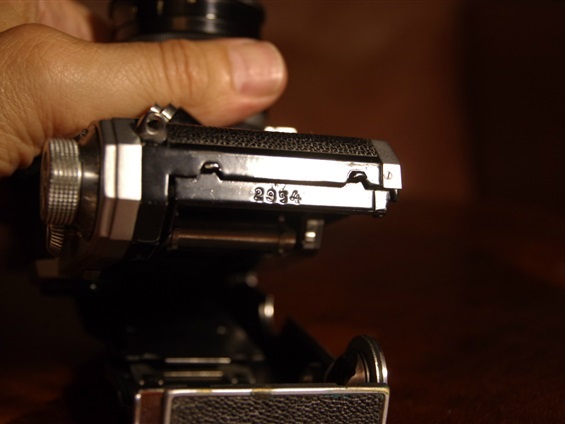 Here is an even earlier Contax S with a very low sn; 2954! Comes with blinded self timer hole. Note that the logos are only engraved, not painted. That also points towards a very early sample. But the time setting wheel is coned, not cylindrical, which belongs to an early 1950 production rather than a late 1949. It wears a Carl Zeiss Jena Biotar 58/2 lens in black, one of the earliest lenses to come in all black. Sn. 3424669. From '51/'52, so probably not delivered with the camera. A high class lens. Quite similar to the later ones. This very early edition might have been produced in 1949, but the coned shutter time dial tells us it was (probably) produced among the very first in 1950. A sample with sn. 10086. (External number 44 165.) The lens is a Carl Zeiss Jena silver Biotar 58/2, sn. 3276914. 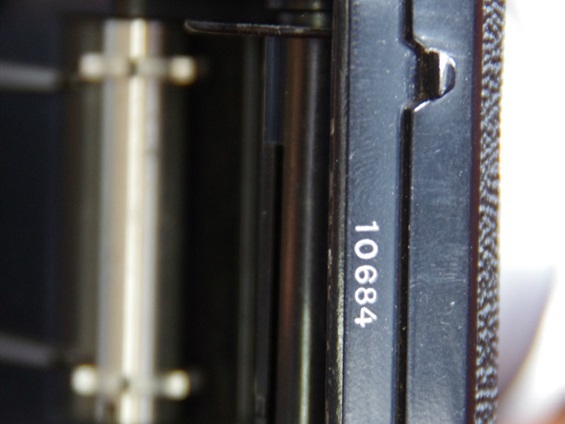 An interesting detail on Contax/Pentacon cameras: There were two serial numbers, one on the outside lower back, and another on the inside, seen vertically when opening the back door. The first one says 44 626. As I compared this sample to others, placing it into the early series production, I had a hard time understanding this relatively high number. Until I found out that the inner number was the real sn., and the outer, more visible one, was some internal production code! So, this sample has sn. 10 684. 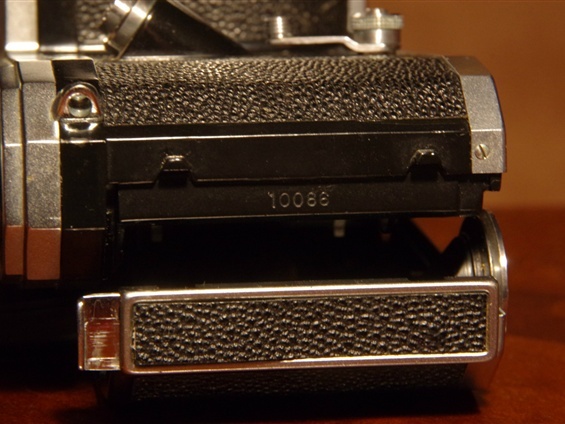 Note: The earlier camera had only the real sn.,placed similar to this one, but not painted white. See the earlier copy. The visible number on the lower back. NOT the serial number! Open the back door and find the real serial number! The sn. 2954. Produced before they introduced a number on the lower back. But inside the opener of the back door you can read 2954. Very low! Note that this sn. is not painted, while the slightly newer one, the 10684, wears the white colour. 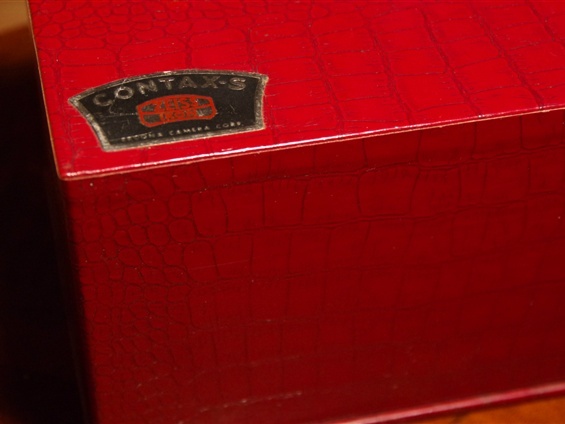 A very nice Contax S of 1950 placed in a display box. This whole set seems almost unused! The red box in which this marvellous camera was delivered. The West-Germans could not make anything like this for 5 years.. The carrying case. Hardly used. The very neat silver neck strap and a remote release cable with box. 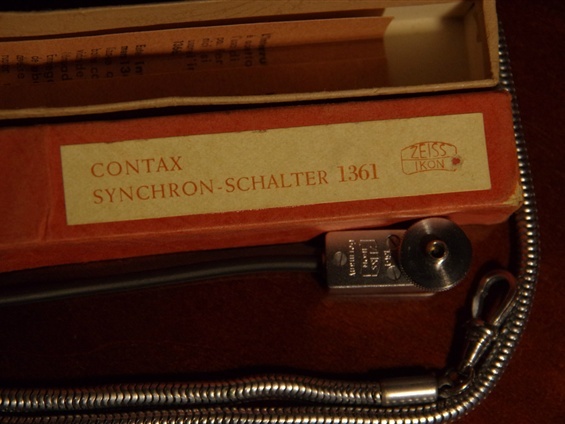 The release cable numbered 1361, also marked on the small box. 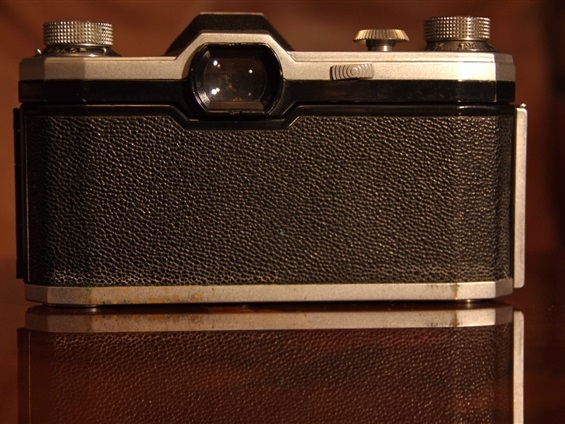 The first Contax series was followed by this model D in 1952. There were only minor changes from the earlier ones, see next picture. Sn. 94485. Flash socket is moved from bottom plate to top plate. 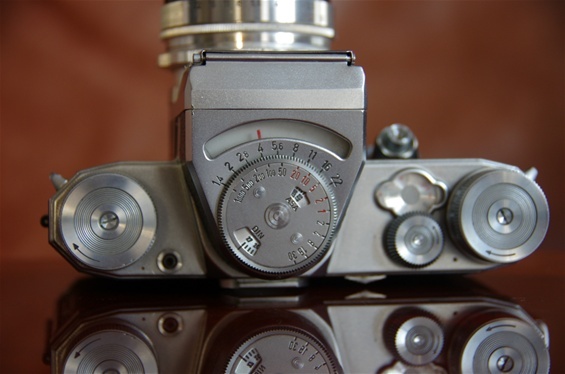 ASA value reminder reaches 400 and film type reminder is redesigned. Shutter times are still 20 and 200, not 25/250. 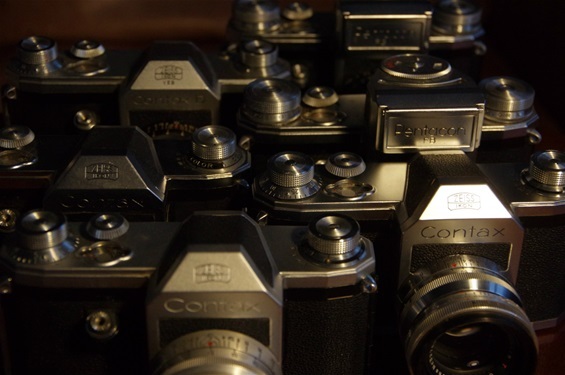 Contax S models, from prototypes A and B in 1948 and '49, through serie produced C in 1950 and '51, via the official D from 1952 till 1956, the E in 1956, till the last F from 1956 till production was stopped in 1962, were all looking very much the same. Details were changed all the time: big knobs or small knobs, engraved tower big or small, ZI letters or not (Zeiss Ikon), self timer, flash sockets. Some of these changes came from the fact that the Dresden branch of the Zeiss Ikon company was taken to court by the West German branch, in their opinion the "real" Zeiss, for using the name. 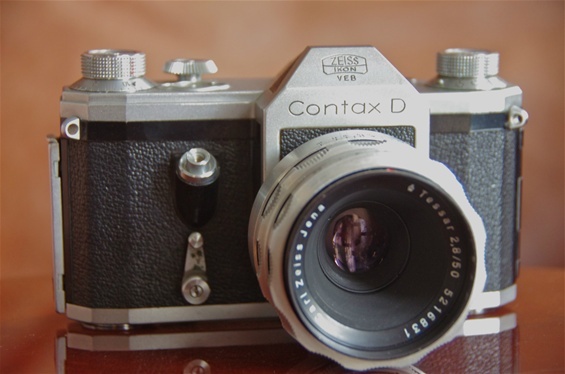 As one can expect, the West Germans won in West Germany, and the Dresden company, now owned by the East German state through the VEB, Volks Eigene Betrieb (Peoples Own Company), was not allowed to use the Contax name for export. 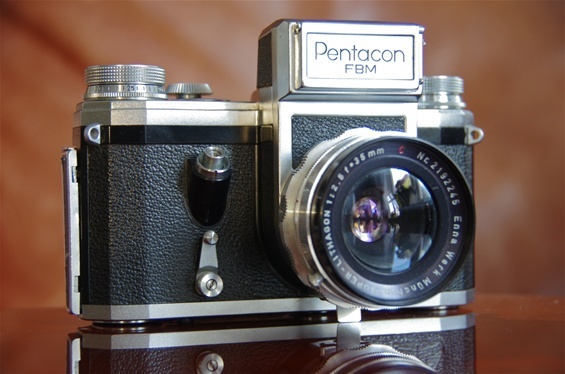 So, they called the export models Pentacon from Penta prism and Contax. 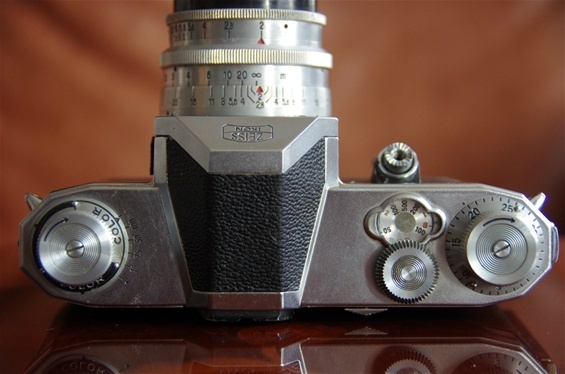 To tell the world that this camera was a true Zeiss Ikon from the main factory in Dresden, they sometimes added ZI under the Ernemann tower ( the logo of the factory) on the front of the prism. Everything here is as it was on the D-model of 1952. The lens is a Carl Zeiss Jena Tessar 50/2,8. Sn. 5237356. 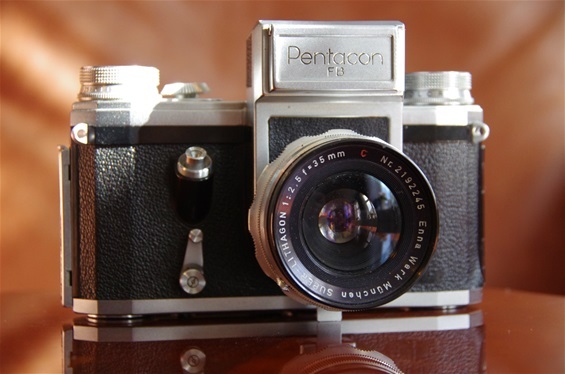 Here is the Pentacon version of the FB series from 1956 with the best light metering so far, but still only a copy of the Contax range finder camera of the 40s. 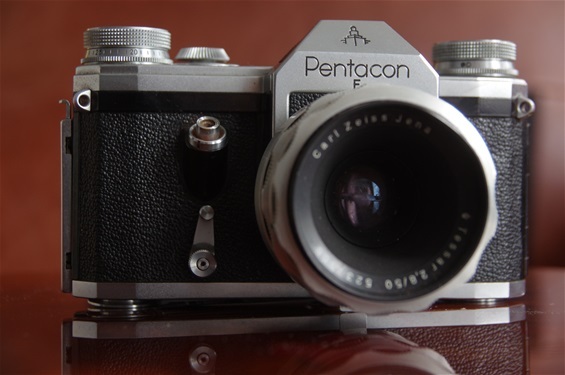 Total production number for Contax/Pentacon PP SLR from '49 till '62 was some 187 000. Sn: 141384. Contax S: S for Spiegel (mirror). Note: The S letter was never engraved on the cameras. The three first letters (A,B,C) were unofficial names for the three (at least) versions from 48-51. Contax D: The fourth version, now with flash socket on top plate. From 1952. 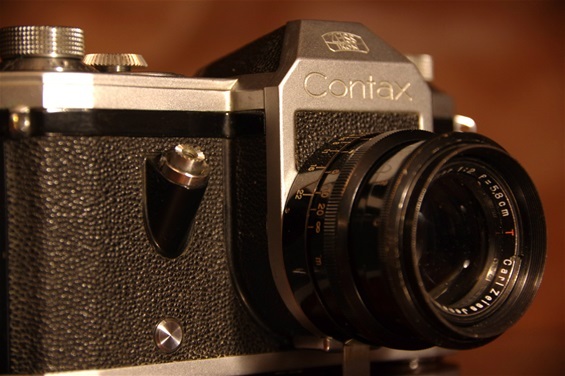 Contax F: besides being the version after E, the F meant Fresnel lens in the prism. Contax FB: F for fresnel, B for the light metering system. Reckognized by the rectangular box instead of the usual prism shape. FBM: The extra M meant that there was added a split image viewer. 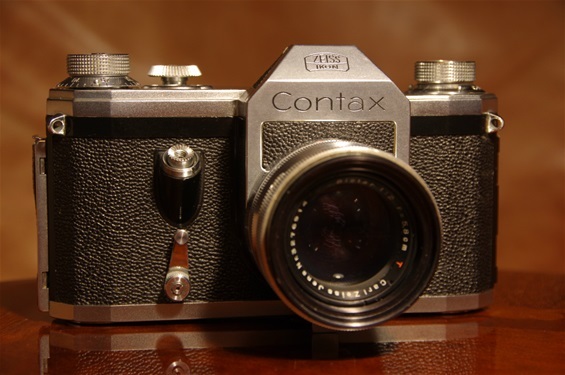 The FBM model of 1958 was the last in the proud series of cameras starting with the Contax S in 1949. The house and almost every detail was kept from the first model, but the split image finder (M) was added to the FB. F was for Fresnel lens, a specially shaped glass over the ground glass, giving a brighter image (used by most brands). The B meant incorporated metering system. Sn. 128020. Everything here is exactly like the FB from 1956. Only the size of the winder and rewinder knobs differs visually from the E and earlier models.